A stylishly practical option, sectional garage doors are constructed using panels that rise vertically then glide horizontally into the garage on a set of tracks suspended from the walls or ceiling. Sectional garage doors will open and close with minimum effort and will allow you to drive tight up to the garage. Being able to boast as being the most insulated door on the market, a sectional garage door is an ideal choice for people wanting to keep their garage warm in the winter months. There is an endless choice of colours and finishes available, as well as an array of different window options. Sectional garage doors are becoming a more and more popular choice because they are incredibly robust, very well engineered and will suit any type of home. 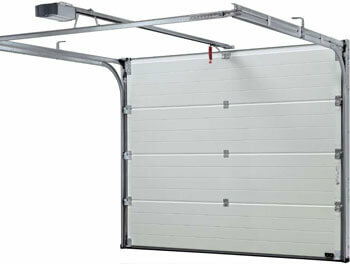 Call us to find out more about sectional garage doors today. “Very polite, good communication, very organized. Extremely satisfied with the work. Highly recommended.